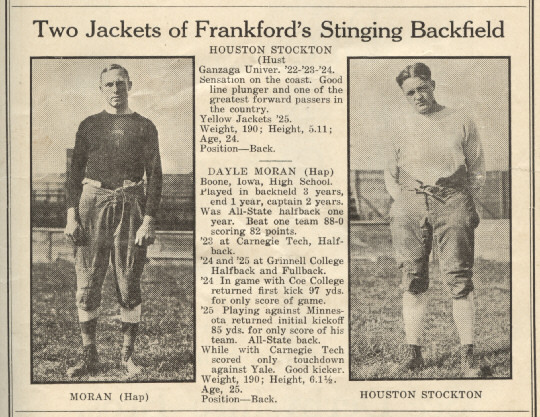 My father, Francis Dayle Hap Moran, played eight years in the NFL  from 1926 through 1933. Although he wasnt a shy man by any means, he didnt talk much about past glory days, and it wasnt until after his death in 1994 that a full picture of his career became clear. All in all, I think youll agree, he was the kind of player that made pro football the explosive, exciting sport that Americans learned to love then and still love today. The best outdoor sports entertainment of the Fall season was the football game between the New York professional football Giants and the Green Bay Packers at the Polo Grounds last Sunday afternoon. Any time you can go to a field and see Hank Bruder, Russ Saunders, Benny Friedman, Badgro, Moran and Blood playing on the same afternoon, its something not to miss. like a star let down from the planet Mars with plays that the poor fish of the earth knew nothing about. We are certainly pleased to tell our many readers of the wonderful addition this player has made to the team and the spirit he put in the rest of the players. . The Yellow Jackets went on to win the NFL title that year and Dad was the second high scorer for the team and 12th for the NFL. Mr. Mara has Hap Moran, who once upon a time played with Carnegie Tech. 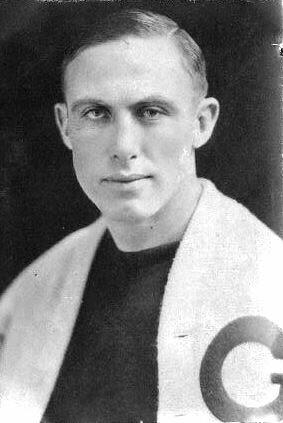 Hap is thirty two years old and is now in his sixth season with the Giants. Back in Boone, Iowa, in the winter he is a train dispatcher. Hap has been around a long time and is pretty well battered, but they tie him together for a few plays every Sunday and he usually catches a pass or two. Just for the record, Hap caught the first touchdown pass I threw as a pro. It was not without reason that your Dad was called Hap. He always had a smile on his face. Apparently, though, my fathers good disposition didnt keep him from being a target for battering by opponents. How battered was he? There was a separated shoulder, broken fingers, and many broken noses. In one game after he broke his nose he had a metal cup taped over his busted beak for protection and went back in. A few moments later he got smashed in the face a second time. The cup only added to the injury. On the way to the hospital the car was pulled over by the police. There had been a bank robbery in the neighborhood and the robber had been shot in the face. The way Dad looked, they thought he was the perpetrator. He was a tough man to get out of a game. Another time his mouth was badly cut. He was stitched up on the sidelines and went back in to call plays. Bad move. He suddenly realized his tongue had been sown to his lip! When he tried to call a play he couldnt talk. All of the mayhem wasnt caused by the other team. In a 1948 column, Arthur Daley of the New York Times reported on a conversation between Steve Owen and Mel Hein. 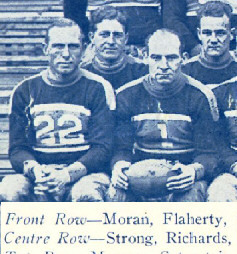 So by 1933 Dad was pretty well battered, but along the way he had contributed some great moments to the early days of the NFL. Although he eventually made his name in football, in High School he was better known for basketball. He was captain of the Iowa All-State team and his team from Boone won the state championship and the right to represent Iowa at the Interscholastic Tournament at the University of Chicago. There he set a record for the longest shot in the history of the tournament (they stopped the game and measured) and was named as a High School All-American by Amos Alonzo Stagg. After one year at Grinnell College in Iowa he was recruited by Carnegie Tech in Pittsburgh primarily for basketball. In those days Carnegie Tech played Notre Dame, and in that game in 1922 the Four Horsemen first formed up as a backfield under the coaching of Knute Rockne. Dad would later play against that lineup in their last game together in 1930. When he got hurt playing football, he lost his scholarship at Carnegie and went back to Grinnell. In the days before the big pass dominated the game, it was the break away run that got the crowd on its feet. It was also the long run that earned my Dad the reputation that got him a shot at the pros. Two college games in which he ran opening kick-offs back for touchdowns received wide coverage. 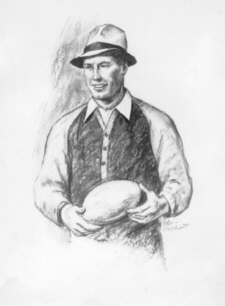 Hap Moran, Grinnell fullback, threw consternation into the ranks of the large crowd of Coe home comers today when he received Smiths kickoff on the 5 yard line and raced 95 yards through the entire Coe team for a touchdown. Thereafter both teams battled firmly and the one touchdown constituted the entire scoring, Grinnell winning, 6 to 0. One thing youre going to like about Moran is that he loves to play football. He will do anything you tell him and will work like a Trojan, take discipline without any comment and will sacrifice himself at all times for the benefit of the team. He is just as willing to block as run with the ball, as he does not seem to care what his appointed duty is, just so he gets to play. If you make arrangements to get this lad I feel you will be very satisfied. .a forward pass, Smythe to Hap Moran, placed the pigskin on the 2 yard line, where, in the second play, Moran took it over. The next game he still had no number in the roster. But he made the starting lineup at left halfback and stayed there for the remainder of the season. Eventually they gave him the #4 jersey. What must have been one of the more exciting games of the season came on the weekend of October 16. The Yellow Jackets were not allowed to play at home on Sundays. They were a Philadelphia team and Philadelphia had blue laws which closed stores and sporting events on Sunday. So they played their home games on Saturdays and then often traveled to their opponents city for a return match on Sunday. On the weekend of October 16 they played the New York Giants. The home game saw the Jackets defeat the Giants 6 to 0 on two field goals by another rookie, Johnny Budd of Lafayette College. After vicious line smashes by Moran, Stockton, and Hamer, the ball was carried deep into New Yorks territory where a pass - Stockton to Jones - resulted in a touchdown.